Yasuda Castle (安田城) is a ruins of a flatland castle located in Toyama. It was built by Toyotomi Hideyoshi in 1585 for attacking Toyama Castle. Later it was abandoned, but moats and structures are remained in great condition. Today, Yasuda Castle is famous for its water lily which bloom in June. There is a museum of this castle located right next to this castle. 1. use JR Takayama Line to Fuchu Usaka. Built in: 1585 by Toyotomi Hideyoshi. This castle was built by Toyotomi Hideyoshi when he was attacking Toyama Castle and Sassa Narimasa in 1585. It was brunch castle of Shiratori Castle. After the battle, Ecchu became the land of Maeda Toshiie, and his samurai Okajima Kazuyoshi became the lord of Yasuda Castle. However, soon, it was abandoned. 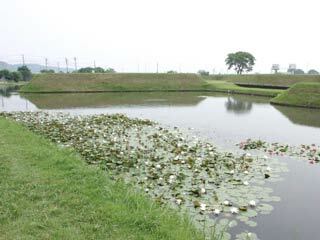 Honmaru, the first bailey, Ninomaru and right bailey and their moat are remaining in great condition. This castle is one of few castles which preserved the moat and structure in great condition. There are many relics found in this ruins, and they are displayed at the museum.